Your trending TOTS (Tips On TuesdayS) feature blog is here and today I’m going to feature a theme with one of my most frequently asked questions – Which platform is my favorite to go Live with? (this is part 4 in my series on LIVE Video, check out the 1st 3 articles on my website). Well, I am so glad you asked! While there are many to choose from – BeLive, Zoom, LiveLeap, BlueJeans, Ecamm, etc… the one I have been really liking lately is Ecamm! * Spoiler Alert - it’s only available for Mac users currently – sorry PC users! Today, I’ll share three of my favorite features about Ecamm that will truly take the cake with your audience! Now, this is the really fun part about going Live! Why? Because this is where you can add color and a little extra pizazz to your Live Videos to stand out,and look very professional to your audience and potential new clients. This platform has saved me so much time, and the best part is that I can re-purpose these videos on LinkedIn as well to create an extra layer of engagement to my original video - Fabulous! Yes, it really is very user-friendly to use no matter your tech experience level! Think of it like attempting a new recipe for the first time that ends up turning out perfect with the first batch! 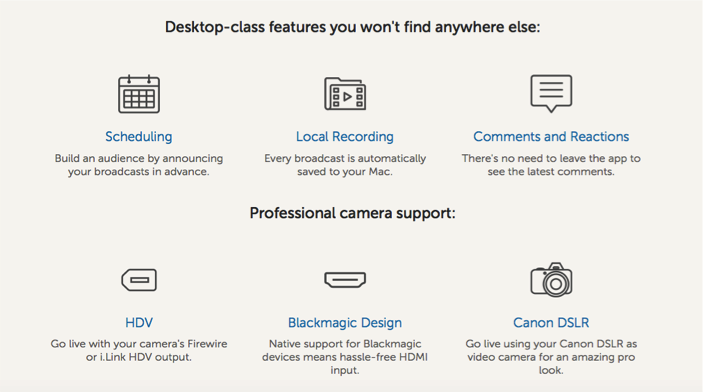 While some platforms require more of a learning curve, Ecamm pretty much sets you up right away – with impressive picture quality, drag and drop features for adding images, pre-recorded videos, text, and even a desktop screen while live broadcasting. If that wasn’t enough to sign up right now – you can even read real-time viewer comments right from the broadcast screen without having to open other tabs! How’s THAT for extra pizzazz?! Remember how I said this has saved me so much time? Well, the fact I can choose which page to broadcast to and then automatically upload to my YouTube Channels helps me share my Live Videos quickly to all my important pages and groups, is like my recipe magically doubling or quadrupling without even needing to have more ingredients! I LOVE this, and the results of all that extra engagement is truly worth every penny! I was so excited to learn I could easily add my own personal branding banner that people can see throughout the length of the broadcast! You can have fun with adding your logo, tag-line, and platforms for people to easily reach you during – or after the broadcast. Join me for more TOTS you need to know about to keep being fabulous with your LinkedIn profile! Unsure about which platform to use for your brand? Let's chat to discover which service or product option would be great for you! Tune in for my Facebook Live Show, “Bite-Sized Tips for Busy Entrepreneurs” the 1st and 3rd Wednesdays at 7pm PST. You can watch previous episodes here. Need help with your LinkedIn Profile? Looking to create a strategy on how to use LinkedIn for your business? Couldn't make all the sessions at Social Media Marketing World 2018? Live Video Communication Tips The 3 Main ingredients YOU NEED for Speaking like a PRO on Live Video!